At XClutch we don't just produce clutches for passenger performance vehicles, we also have a proud history producing heavy duty clutch kits for an extensive range of 4x4 vehicles. Known elsewhere around the world as Xtreme Outback, the 4x4 heavy duty range has been developed in-house at Australian Clutch Services and draws on over 25 years of experience to produce a clutch kit that provides exceptional performance and driveability. The range of clutch kits includes options for everything from the daily driver through to rally vehicles that compete in some of the most gruelling rallies on the planet. The stage 1 heavy duty organic clutch kit provides excellent driveability along with an approximate 15-40% increase in clamp force (application specific). These clutch kits are mainly used in street vehicles with larger wheels or performance upgrades as well as vehicles that are regularly used off-road or tow at the limit of their tow capacity. Providing even more clamping force than the stage 1 kits, the stage 1X range is designed for vehicles that require a higher torque capacity. These kits are still used for street driving but offer a 30-50% increase in clamp force. The Stage 1X range is also ideal for vehicles with performance modification or that regularly tow at the limit of their tow capacity. Stage 2 heavy duty 4x4 kits are available with either a sprung ceramic friction disc or a cushioned ceramic friction disc. These kits are designed for competition use with the sprung ceramic being used in high speed trial and desert racing whilst the cushioned ceramic is more suited to low speed trial that requires more modulation of the clutch. Both have an approximate 15-40% increase in clamping force. The Stage 2R range is desigend for rally use where the vehicle still needs to be driven between stages. With a very high clamp force pressure plate (75-120% increase over standard) along with a sprung paddle style ceramic friction disc. 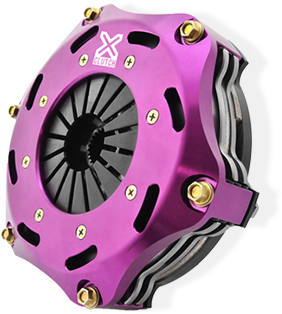 The 9" (230mm) twin disc ceramic clutch is designed for very high horsepower vehicles and racing applications. Used in 1000+HP 4x4 vehicles, these kits offer a lightweight alloy pressure plate, chromoly flywheel, 2 button style friction discs and an intermediate plate. Click HERE to download PDF catalogue.